Here's to another year of fantabulous creating, exploring, connecting and living! 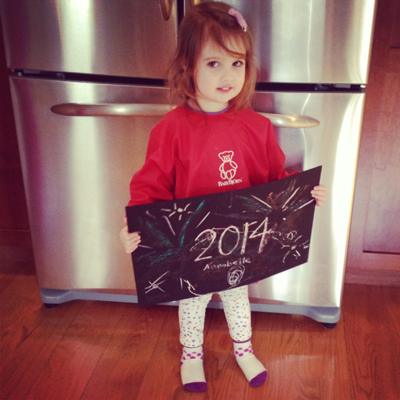 On New Year's Eve, Annabelle and I created some fun fireworks art with white chalk and glitter glue on black mat board. Fun! 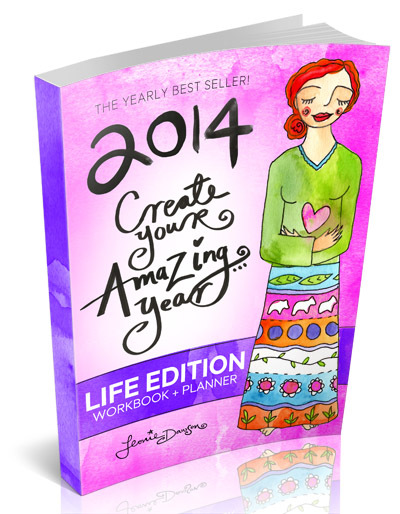 If you're looking for a way to wrap up 2013, plan ahead for 2014, and a great a way to explore this month's "past, present, future" theme, then I recommend checking out Leonie Dawson's 2014 Create Your Amazing Year Workbook, which you can now get in a physical book format or in a download and print yourself version. I've done this workbook for years now and it's a great way to focus your goals and action steps, while honoring all you've accomplished in the year previously. Enjoy! Have you selected a word for the year? This is another ritual I like to do each year. This year I chose the word "live" because I want to really live all the big and especially the little moments this year. 30 days have come and gone. Amazing! Although I wish I could have gotten around to see everyone else's work more and this month was crazy busy (and crazy messy), I think this was my favorite Art Every Day Month yet. I'm excited about a lot of the work I made and even better, I was able to share the experience this month with Annabelle. It was so unexpected and lovely to create alongside her, to talk about art, and to see her love of creating grow. 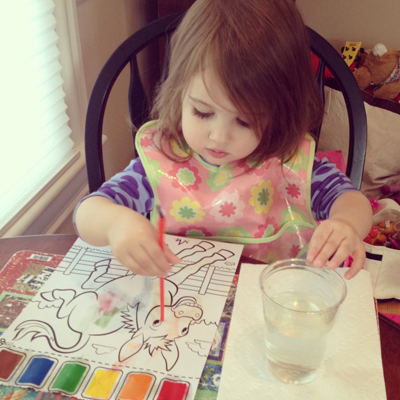 Here's Annabelle in one of the artsy activities she got up to today, now that we're back having a quiet day at home. This was moments before the cup of water tipped, water went everywhere and she was crying about wet pants. Haha. Real life. 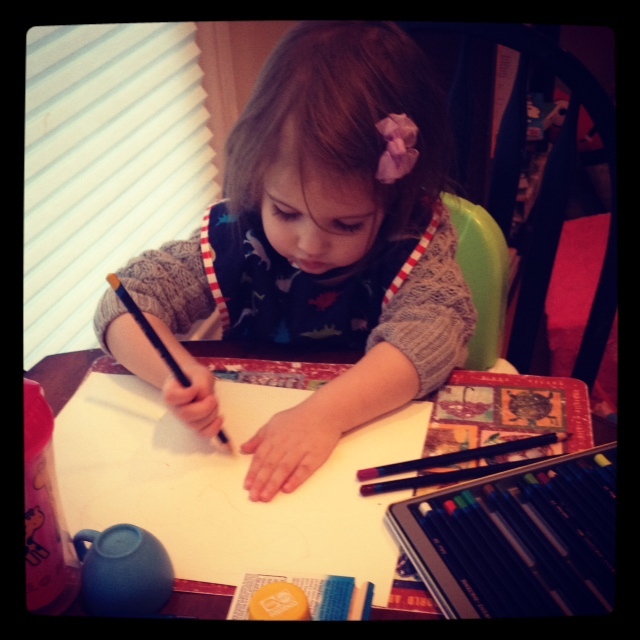 But after the dramatic clean up, she got back to it, this time choosing to draw with pencils. Much drier. Thank you all for joining me on this month of creating, whether you created one day, 10 days, 25, or all 30, I hope you enjoyed the added creativity in your life! Congratulations on all you've accomplished!! We'll carry on with weekly check-ins (Mondays) for the Creative Every Day Challenge here, so feel free to continue on in that way if you're so inspired and definitely join me again next November for another Art Every Day Month! More inkblot art today on a busy traveling day. Constellation sisters! We had a wonderful time with family the last few days and I hope you did too. 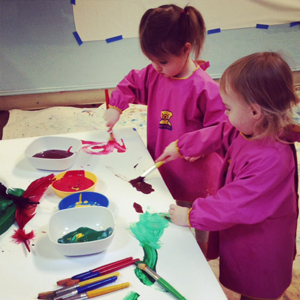 Here's a picture from Annabelle's art-making yesterday. Fun, eh? At the end of each month I will announce the totally optional theme for the following month. For the month of December 2012, the theme will be Celebrate. If this theme looks familiar, it is! I did this one last year, but I felt the need to bring it back again this year. There's always room for more celebration. And if you've just about finished up Art Every Day Month, you should definitely be celebrating! *Find ways to celebrate your accomplishments this month, big and small. *Enjoy creating decorations for the holiday season. *Make some delicious food to celebrate the season. *Create mini celebrations each day: a tiny tea party, gold stars, a work of art for someone you love. *Celebrate your life through gratitude. Keep a list of something your grateful for each day. *Celebrate your body through movement. Put on some music and move, get out in nature and take a walk, put on a yoga dvd and stretch. 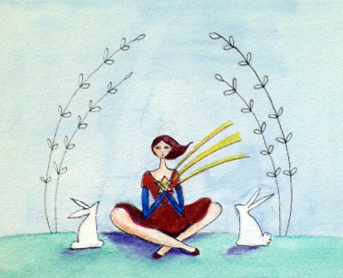 *Celebrate your favorite medium with joyous creating. What color is your happiness, what medium speaks celebration to you? *Write a piece celebrating who you've become as an artist this year. p.s. 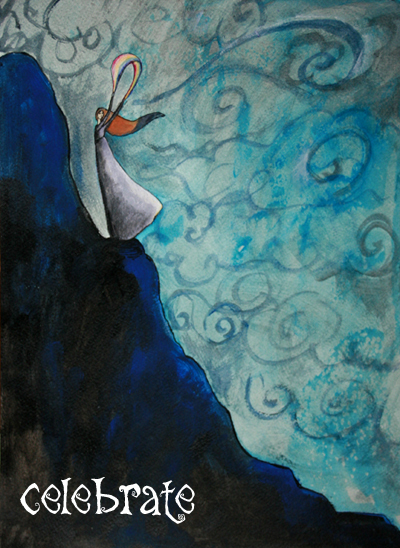 The art above is adapted from "Releasing Fears" available here. 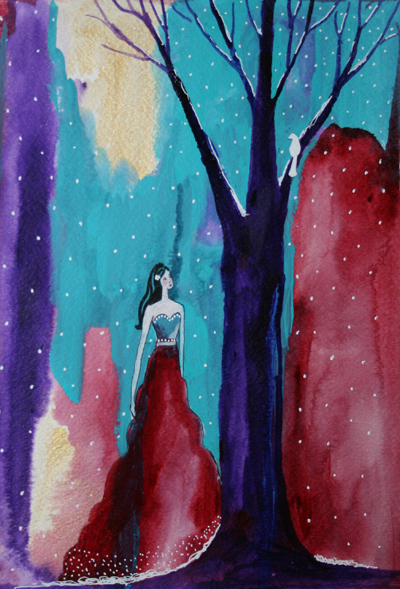 Posted by Leah on November 28th, 2013 in art, art every day month | Permalink | No Comments. On days like today when art needs to happen fast, inkblot art is one of my go-to things! 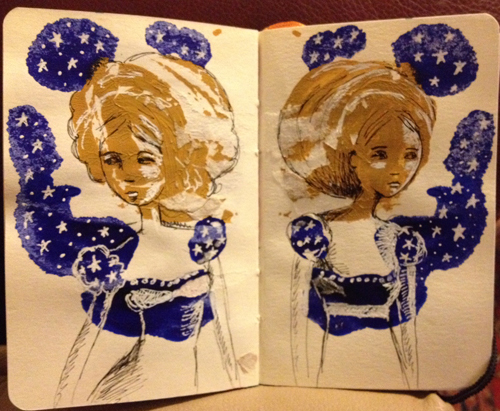 I squish some paint and/or ink between the pages of a small sketchbook, then come back later to see what images pop out. 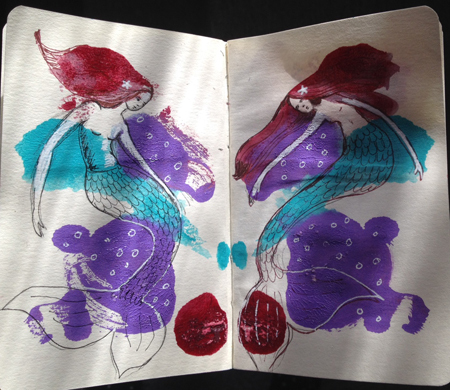 Today it was two floating mermaids. I am so very grateful for all the creativity you all are sharing this month. It's been awesome. Keep it up, folks. We're almost there! Happy Thanksgiving! Just a little one today, as we prep for holiday travel. Work in these last few days may be on the smaller side because I'll be out of town, but I'll be doing something! I'm amazed at how quickly this month is coming to a close! This piece is watercolor pencil, acrylic and ink on paper. Annabelle had a great time in art class today. We made little handprint turkeys, but I forgot ours in class. Oops! She didn't think they looked like turkeys anyway. She told me, "Mama, this looks like a hand." Haha. 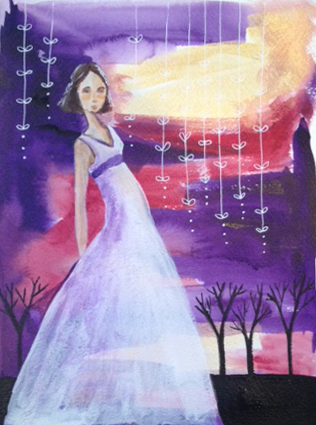 This piece was created for a friend's little girl's purple and gray room. 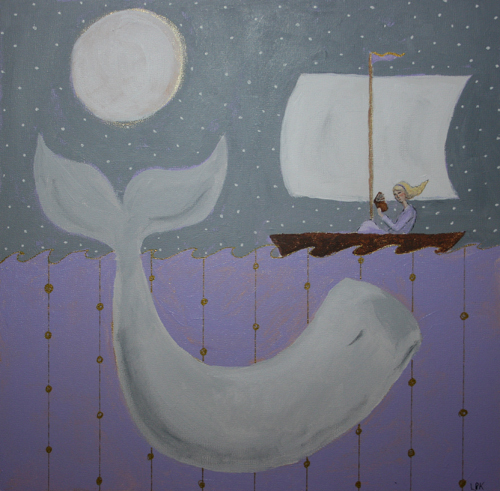 This little girl loves books, so I thought I'd have her reading a story in a boat, with a whale listening on. The gold stripes show up in this picture a lot more than they do in real life, where they're much more subtle. It's 12"x12" on panel with acrylic and ink. 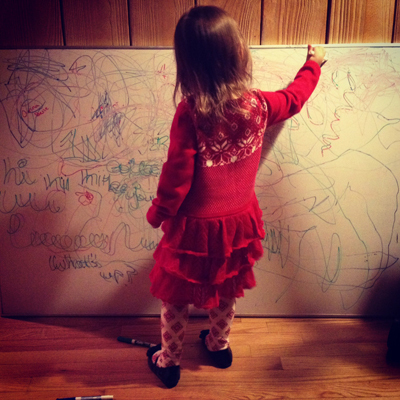 While I was starting this piece, Annabelle was trying really hard to trace her hands, which was super cute. And here's part two! I did a sketch of this earlier in the year and have been wanting to paint it for Annabelle's big girl room. 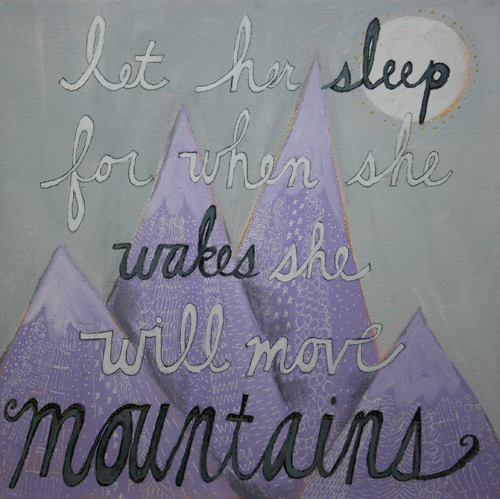 My little girl may not like sleep, but I do believe she can move mountains. Annabelle's creations today included block towers and one block "office", complete with desks and a "quiet room" like the new office space her daddy is moving into this winter. Haha. Today, I've got a work in progress! I didn't want to rush the last part, so I'm stopping here for now and will finish the second part tomorrow. 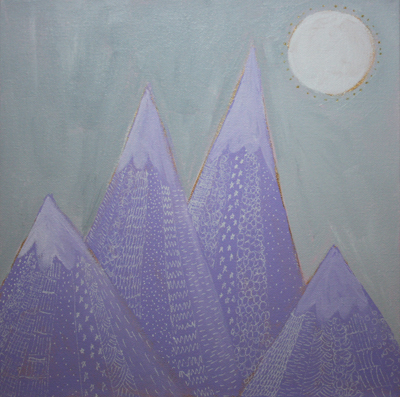 The first bit is acrylic paint and ink on a 12"x12" canvas. Annabelle is feeling much better today, can you tell? haha. 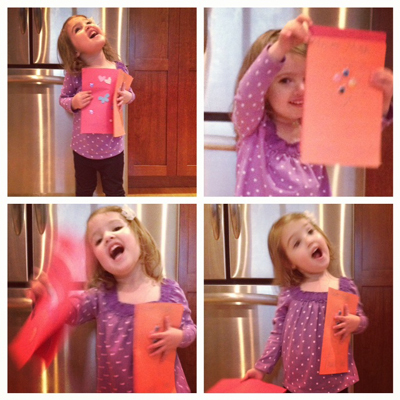 We spent the morning making some thank you notes for a couple awesome friends.